DMD870 Digital Stepper Drive / Motion Control Products Ltd.
Motion Control Products Ltd (MCP)'s digital stepper drive DMD870 (DM870) is a versatility fully digital stepper drive based on a DSP with advanced control algorithm. 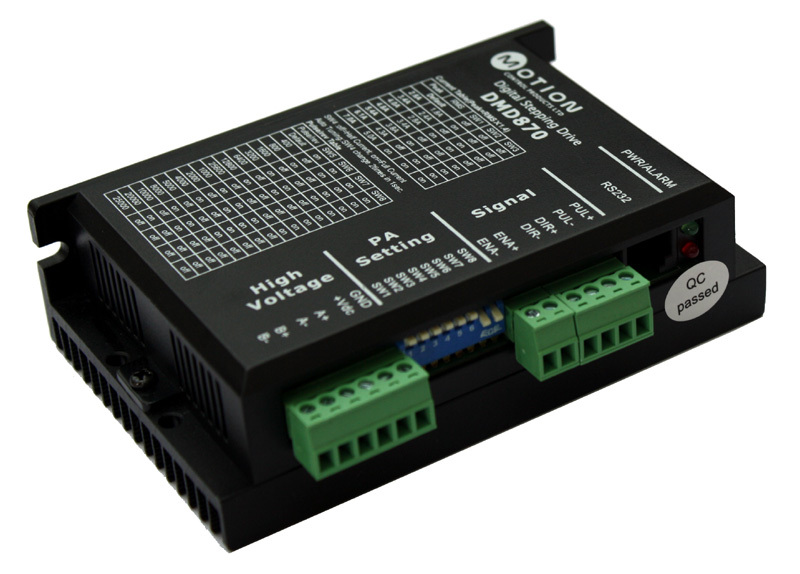 The DMD870 (DM870) is the next generation of digital stepper controls. It brings a unique level of system smoothness, providing optimum torque and nulls mid-range instability. Motor auto-identification and parameter auto-configuration technology offers optimum responses with different motors and easy-to-use. The driven motors can run with much smaller noise, lower heating, smoother movement than most of the Drives in the markets. Its unique features make the DMD870 (DM870) an ideal solution for applications that require low-speed smoothness. Compared to the DMD432 (DM432C), broader input voltage and output current ranges make DMD870 (DM870) being able to drive much more motors from size NEMA 17 to NEMA 34. What’s more, thanks to its higher performance DSP, driven motors can achieve much higher speed (above 3000RPM), offering servo-like performances. DMD870 (DM870) stepper drive is regarded as an improved model originally from DMD556, while supports broader input voltage range. It can be used in various kinds of machines, such as laser cutters, laser markers, high precision X-Y tables, labeling machines and so on. Its unique features make the DMD870 (DM870) an ideal solution for applications that require both low-speed smoothness and high speed performances. For more technical information, please download the datasheet / user manual below.